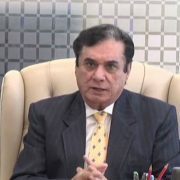 ISLAMABAD (92 News) – NAB Chairman Justice (retd) Javed Iqbal has said that it their top priority to get the looted money back from private and cooperative societies. Addressing a meeting on Thursday, he said that the NAB is proceeding against corrupt elements, not faces. The NAB chief also took notice of the overnight approval of the design and 10-foot road of Park Enclave Society owned by PTI leader Aleem Khan. He ordered the NAB Rawalpindi DG to look into the complaint.